For some of us, it’s hard to sleep well at the campground. Though surprising, it’s not always peaceful when you are away from the comforts of home and sleeping in the great outdoors. There are a few things you can do to help you sleep better and get a good night’s rest while camping. Sure, sleeping under the stars and next to a campfire while listening to the bubbling creek run by sounds fantastic, and it is, but not everyone is able to relax and sleep so well under these conditions. As much as we love the idea of falling asleep to the sounds of nature, sometimes the solitude of wilderness can actually be loud – the quiet might actually keep you up at night. In that case, choose a campsite with optimum sound levels for your personal preference, but if that doesn’t work, consider bringing your earplugs. When selecting where to pitch your tent (or park your RV) make sure it is flat, or if you have a slight hill, make sure your head is uphill. 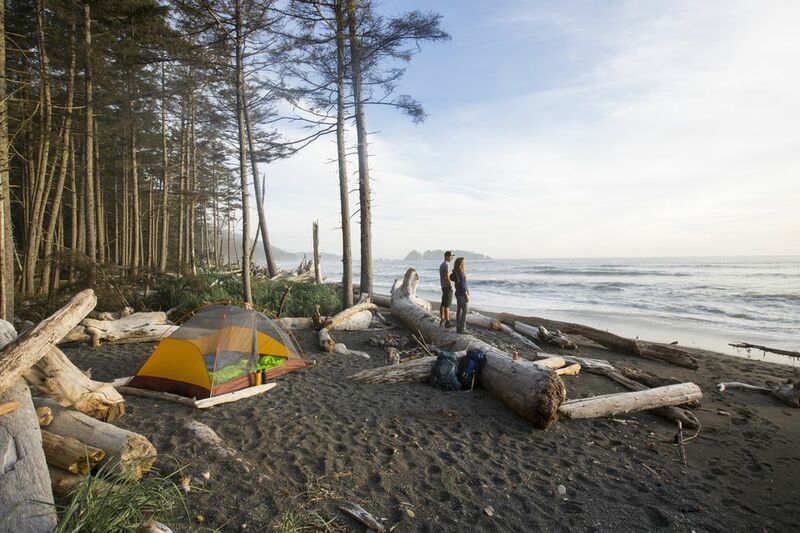 For tent campers, look for a spot with few rocks and if possible, softer ground like grass or pine needles. If you need to, remove any large rocks from your tent pad. Make sure you have the proper amount of bed cushioning that you need to be comfortable. Test your air mattress at home on a hard surface to see if it inflates earplugs – there is nothing worse than an air mattress that deflates in the middle of the night! Try adding memory foam or egg crate to your camping bed for extra comfort. Sleeping bags are sold with a temperature rating, but don’t let that fool you. Depending on the manufacturer, sleeping bag ratings can vary. Check any reviews of the sleeping bag to see what others say about the rating. Typically, you’ll want a bag rated much cooler than the weather you are expecting. (Make sure to check the forecasted weather before you go.) Extra warmth is good for cozy comfort. If you are unsure about your bag, plan on bringing warm layers to sleep in, or an extra blanket to throw on top, just in case. If the idea of getting into a cold bed isn’t appealing to you, fear not, you can have a warm bed at the campground and you don’t even have to have another body to warm it up for you. Thirty minutes to an hour before bedtime, boil a pot of water and let it cool slightly. Put the hot water into a heat-resistant water bottle, let cool then seal the lid. This is the most important step – make sure the water bottle is closed tightly and that it has cooled enough that it won’t expand and leak. Put the hot water bottle into your sleeping bag. When you slip inside the bag will be toasty warm for you, but be careful that you don’t burn yourself on the hot bottle. Nothing makes a more miserable night sleep than being eaten by bugs all night long. Well, okay there are worse things, but mosquitos in bed aren’t fun. If you prefer to skip the tent and sleep outdoors under the stars, look into mosquito netting. This will help keep the biting bugs away, but still allow you to enjoy the night sky. If you are camping in a tent or RV, double check that there aren’t any holes in screens and if so, patch them up before you go! Natural lavender products also help if the bugs aren’t too bad. Hot chocolate and s’mores are a campfire classic, but all the sugar and caffeine from chocolate might not set you up for a good nights’ rest. Herbal teas help relax the mind and body; chamomile is especially good for sleep time relaxation. No one likes getting up out of their bed during the night at the campground, but sometimes that can’t be avoided. Even if you don’t plan on waking up in the night put a flashlight next to your bed for the unexpected middle of the night scenarios. It will make getting up easier and more comfortable and give you peace of mind as you fall asleep. If you think you will be making trips to the bathroom in the middle of the night, choose a campsite in close proximity to the facilities. This will make this task more comfortable for you.